THERE are few places that exhibit the psychosis of market economics more openly than the art world, where prices are determined by how much cash punters are willing to pay. 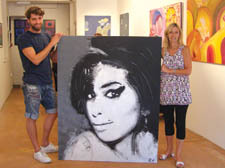 Gaz Med’s third portrait of Amy Winehouse peering from beneath her famous beehive – on display at a Chalk Farm gallery – has already received a bid for £2,000. The Camden Art Gallery, which belongs to Rose Marie Bellemur, who exhibits works in Argentina, Spain and Paris, commissioned Med to complete the latest Winehouse piece after an aggressive bidding war was waged over his previous three portraits of her, all painted from photographs. Bellemur said that as an artist herself the reality that people see art as a business opportunity causes her “pain”. With a set of acrylic images of the songstress by another artist on its way, assistant ­curator Alex Lord admitted he was suffering Winehouse fatigue – but said he remained fascinated by the trade. “Maybe it’s not worth £2,000 but it’s worth what it’s worth to the buyer,” he said. MICHAEL Foot was on top form when I met him on his 95th birthday yesterday (Wednesday). The former Labour Party leader (pictured) was going to Lewes, Sussex, to spend the big day with the siblings of his late wife, the film-maker Jill Craigie, who live there. He was clutching a book by the barrister Geoffrey Robertson QC, which was stuffed with papers including a front page story on Radovan Karadzic. facing a war crimes ­tribunal after his arrest this week. Michael said the chapter was informed by Jill’s 1994 film Two Hours from London, about the build up to the siege of Sarajevo involving Karadzic. “If they’d listened to Jill none of this would have happened,” he told me. a showing attended by Mr Roberston and the newsreader Jon Snow. It’s time for tea: with the Queen! I WAS bowled over when I met her outside Buckingham Palace just before she went in to see the Queen. For years Christine Fahy has served tea and sandwiches during council meetings at the Town Hall, where she has worked for 26 years. All dressed up in her best finery, I couldn’t believe it was same woman on Tuesday afternoon. A well-known face at the Town Hall, she was picked by the higher-ups to join them as a guest because of her long service. “Oh, it was lovely,” she enthused. “There were thousands of cakes, iced coffee, lemonade. I MADE a confession when an elderly man started talking to me at the back of the Clerkenwell church after the Sunday service. I hadn’t come for the service, I admitted. I was looking for Ms ­Lillian Ladele instead. Ms Ladele, as readers may know, is a registrar, and a very conscientious Christian who has won a judgement against the Islington Council after refusing to conduct gay civil partnership ­ceremonies. Ms Ladele is known to regularly attend St James Church, off Clerkenwell Green. Around me young children were handing out tea and cakes to people after a service where the minister, the Rev Andrew Baughen, in an open neck shirt, had given a “talk”, not a sermon, in which quotes from the Bible were flashed up on screens at the front of the pews, all interspersed with clips from video films. Hymns had been sung to the accompaniment of a small, guitar-led group. When I told the man I was astonished by how modern the service was, he said the Bishop of London had instructed the Rev Baughen to get people back into the church. And he was clearly succeeding. There were well over 100 in the congregation, most of them in their 20s and 30s, many dressed casually, with babies and young ­children. Among them, quite a few black ­couples. Unusually, the man regretted, Ms Ladele hadn’t turned up for the service. But he thought she’d been given a hard time by colleagues at Islington Town Hall. If men wanted to live together, fine, but it was wrong, he intimated for the church to give ‘leadership’ sanctifying it. All a hot topic at the current Lambeth conference. A minute or two later, I chatted to Rev Baughen, who surprised me by saying that the man I’d spoken to was in fact his father – and the retired Bishop of Chester! He couldn’t help regretting that while society was more ­“pluralist” it had become less “tolerant” of views like those of Ms Ladele, who held them in good conscience (see page 21). As I left the church, I shook hands with the man I had earlier spoken to, and said he had been “outed” by his son. “I am a retired ­bishop,” he smiled. I asked him whether he was still recognised as a bishop, and he said he was. Once a bishop always a bishop, I thought, as I left the church. ACTOR Sir Ian ­McKellan popped up to Frognal Gardens in Hampstead on Wednesday to unveil a blue plaque in honour of the Ealing Comedy ­stalwart, Alastair Sim. WHENEVER I think of Betty Papworth, who died a few days ago, I see in my mind’s eye a woman I would often meet at anti-war meetings, with keen eyes, a sharp mind, and forever telling me of something that was happening in the borough I should know of . I met her accidentally the last time while shopping at Sainsbury’s in Camden Town, just a few months ago, when she was in her 94th year. She was lively as ever, and still involved in local life. She belonged to what seems a diminishing band of oldies in Camden, many in their 70s and 80s, who still spend their time doing one kind of voluntary work or another. I hope the younger ­generations will produce great souls like Betty – society can’t function without them.